The Roadrunner Memorial Garden wall and location of flagpoles will be slightly different than what is portrayed in the rendering. Refer to the Roadrunner Memorial Garden drawing (below) for an accurate depiction. (Oct. 13, 2017) -- Dirt is turning on The University of Texas at San Antonio (UTSA) Main Campus where a special memorial will soon stand. 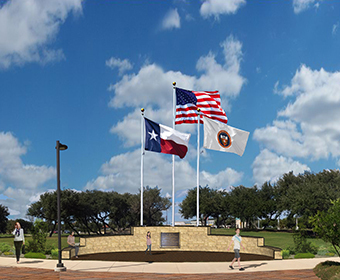 Construction has begun on the Roadrunner Memorial Garden, a designated area located at the UTSA Oval near the Loop 1604 entrance, where students, alumni, faculty and staff will be able to visit and reflect on those who have passed away. The project was student-led and championed by the UTSA Student Government Association (SGA). Fundraising for the project was featured on the university’s crowdfunding platform, LaunchUTSA, and alumni, student organizations, fraternities, sororities, faculty and staff came together to make the garden possible. The students’ initial goal was to raise $25,000. By the end of the campaign, that total exceeded $39,150. "The Roadrunner Memorial Garden represents a permanent place to honor and remember those we have lost,” said Marcus Thomas, SGA president. “The garden will serve as a stronghold for the core values instilled at UTSA and the belief that being a part of something bigger than yourself will encourage us as Roadrunners to move forward as we embark on new journeys in life, while knowing that we are never alone in our time at UTSA." The Roadrunner Memorial Garden will include a semicircular paved plaza with a limestone-faced, three-tiered, semicircular retaining wall. Three flagpoles with concrete foundations will be erected north of the stone-faced retaining wall. LED lighting will be installed to illuminate each flagpole at night and electrical infrastructure will be added for future tree lighting. The pavers and limestone will be similar to the existing materials currently located at the Oval and surrounding areas. A bronze plaque with an engraved memorial message will be installed on the south side of the retaining wall. The project is expected to be completed this December. To learn more about giving to UTSA, visit giving.utsa.edu. Learn more about the UTSA Student Government Association. View the Roadrunner Memorial Garden drawing.